1. I am glad to be here for the 13th Convention of the Central Information Commission. 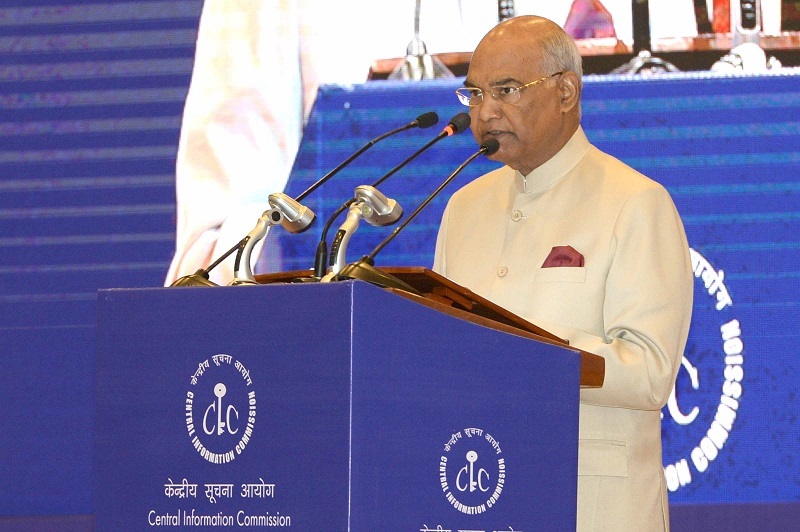 I understand I am the fourth President of India to address this Convention. In fact, in 2006, my distinguished predecessor Dr A.P.J. Abdul Kalam had given the inaugural address at the very first convention of the CIC. Today’s date marks the anniversary of the day in 2005 when the Right to Information Act came into force. Over the years the RTI Act has contributed to the deepening of our democracy and has helped add to the knowledge base of our citizens. I must recall here that I was a Member of Parliament when the RTI law was enacted and part of the Standing Committee deliberations that helped give final form to the legislation. As such, this is a moment of personal satisfaction for me. 2. Free flow of information is the essence of democracy. And for the people of a free and free-spirited country, information is power. They have a right to know how they are being governed, how public money is being spent, how public and national resources are being deployed, how public services are being delivered, and how public works and welfare programmes are being carried out. In a democracy, there is no such thing as too much information. Information overload is always preferable to information deficit. 3. Right to Information builds on these principles. It creates a pedestal for transparent and participatory governance. In 1946, the first session of the United Nations General Assembly resolved that the "Freedom of Information is a fundamental human right and the touchstone of all the freedoms to which the UN is consecrated.” I am told that the first RTI-related law was introduced in Sweden in 1766 – over 250 years ago. In 1990, as the Cold War ended, only eleven countries had an RTI law. In the wave of democratisation that followed, between 1990 and 2016, 104 more countries gave themselves RTI laws. India was part of this dramatic expansion. 4. In India, the Central Information Commission is the custodian of the RTI Act. In the past 13 years, the CIC, along with State Information Commissions that have been set up in every state, enforces the law and empowers citizens with the information they seek. India has appointed half a million public information officers under the Act. The estimate of requests for information, I am told, is as high as six million requests a year. These numbers are astounding. Appropriately they are the highest in the world, in keeping with India’s status as the world’s largest democracy. I congratulate the CIC and all sister and subordinate institutions for these achievements. 5. RTI is not a standalone. It is part of the larger narrative of strengthening Indian democracy, of ensuring transparency across systems of governance, and of building capacities of the common citizen to enable him or her to take informed decisions and make informed choices. Above all, it is about nurturing the social contract of trust between the citizen and the state – where both must have faith in each other. A related and parallel implication is to ensure rational use of public resources to check instances of corruption or waste. 6. To inform, trust and ultimately empower ordinary citizens are admirable goals but frankly they are not ends in themselves. It is only when we link this process to the realisation of definite objectives that engage, enable and ensure efficiency – and so serve to make life that much better for the citizen – that we complete the narrative of democracy. RTI is part of such a wider theme. 7. This is a theme that engages citizens by listening to them and by using citizen inputs in decision making and policy shaping. An example is the consultative process that precedes the framing of parliamentary laws. Another example is the reception of real-time feedback and inputs on a new mechanism such as the Goods and Services Tax and a responsive government absorbing that feedback and making necessary changes. The institutional form of such a concept can perhaps be found in MyGov– conceived and created as the world’s largest citizen engagement platform. 8. This is also a theme that enables the citizen – by giving him or her right to self-authenticate and self-attest documents. And by proactively providing information – for instance by way of constantly updated online dashboards that tell one and all how many toilets have been constructed as part of the Swachh Bharat Mission; how many LED bulbs have been distributed under the UJALA scheme; and how many loans and of what cumulative value have been given under the Mudra Yojana. 9. RTI itself enables the citizen when it allows him or her to ascertain the pace and quality of services being delivered – why the road outside the house is not ready yet; on what basis a certain development project has been formulated; or why a certain application to a government agency is still pending. 10. And finally, Ladies and Gentlemen, RTI is part of a theme that makes for greater efficiency in both delivering services to a citizen as well as using public resources and finances. This improves transparency and removes doubts that may arise about favouritism and misappropriation. The Internet and the digital economy have been used to advance e-auctions of mining blocks. They have helped create the Government e-Market or GeM portal for public procurement of goods and services. And the JAM trinity – Jandhan accounts, Aadhar-based unique identities and mobile phones – has helped with direct bank transfers to beneficiaries of schemes. 11. All these are promoting efficiency and checking wastage. They act as a bulwark against corruption. They are part of the same architecture of citizen empowerment, citizen enabling and public efficiency that has inspired the Right to Information. 12. The quest to enhance the citizen’s access to information is relentless. While it is a separate silo from the Right to Information, there is also need to look at our declassification protocols for government and archival documents and see how we can modernise these. Open government and the pursuit of legitimate public oversight are a desirable and a dynamic process. We can never do enough; we can never aim too high. 13. In conclusion, I would like to touch upon the fine balance between the Right to Information and the Right to Privacy. I commend the CIC for upholding the RTI’s basic charter that public records, with some exceptions for subjects such as national security, are open to public scrutiny – but private records of individual citizens are protected from intrusive third-party curiosity. We must be cautious against fringe cases that try to use the RTI mechanism to settle personal scores. Especially in an age when privacy has become a matter of such intense debate, it is crucial to maintain this balance. 14. So far the CIC and its supportive institutions have managed this balance extremely well. I am confident that you will continue to do so, as you push ahead with the cause of the Right to Information. With those words, I wish you all the best for this Convention as well as for your future endeavours.